Continuing the trend of beating their South Korean rivals Samsung to the punch in every market they enter their new technology (including the pair’s most recent expansion to the USA), electronics company LG have offered consumers in Germany their first chance to own a curved-screen TV, with the arrival of the 55-inch ‘LG 55EA980V’ curved OLED set in the most populated European country, with a more ‘continental’ launch already planned by the end of the year. Announcing the move at the weekend, LG claimed that the next-generation set would be available through ‘select German retailers’ for the price of €8,999 by the end of this month. The set in question is naturally a fairly new standard given that only two companies have released such a product, with the ’55EA9800′ carrying a 4.3mm depth and weight of around 17kg, with the key selling point of the screen designed to be that it has a curved screen that ensures ‘each section is the same distance from your eyes’. Promising to enter a selection of other European countries in Q4 2013, LG have set their product at a current price that when converted is approximately $3,000 less than the same item in the USA, although with Samsung cutting costs across the Atlantic to better compete in the new market, it is likely that the costs will be more equal in the near future. SEOUL, Aug. 25, 2013 – LG Electronics (LG) today announced the availability of its CURVED OLED TV (55EA9800) in Germany, becoming the first TV maker to bring advanced OLED TV technology to European customers. The CURVED OLED TV will be sold at select retailers across the country starting this week and will roll out in other European markets in the fourth quarter. 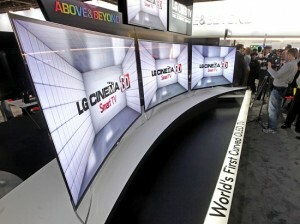 DisplaySearch estimates Europe will account for up to 30 percent of the global OLED TV market by 2017. The respected research firm also projects worldwide demand for OLED TVs will grow to more than seven million units by 2016. As the first company to offer a large-screen CURVED OLED TV in the United States and Europe, LG is poised to become the standard-setter for the next generation TV market. Featuring an elegantly curved screen and LG’s own WRGB OLED technology, the CURVED OLED TV provides exceptional picture quality and an immersive viewing experience. A triumph of design, the cutting-edge unit has been awarded the prestigious Red Dot: Best of the Best honor and has also been certified by respected international product testing bodies, TÜV Rheinland, Intertek and VDE for its unsurpassed picture quality. LG’s premium TV is also the first OLED TV in the world to have received THX certification. The CURVED OLED TV will be introduced to German customers at a special event at high-end electronics retailer HIFI Profis in Frankfurt. The one-of-a-kind TV in Germany will carry a suggested price of EUR 8,999. Prices in other European markets will be announced at launch time.